This is one of the most memorable non-recipe recipes I’ve ever come up with – for several reasons. 1) This is extremely tasty. 2) This is extremely tasty and very adaptable to a variety of palates, tastes, and events. 3) This is an extremely tasty source of party conversation. I know because I wolfed down about a metric ton of this stuff at a family reunion last summer. I spent a good bit of time scooping it into my piehole while obsessing about all the new people I was meeting and having social anxiety over and worrying about whether Aunt ______ liked me or not. Nothing helps break the ice like asking about a recipe with bits of food falling from your mouth. You should try it. Totally. 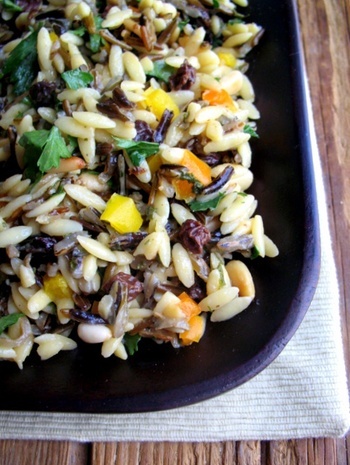 This is an adaptation of the orzo and wild rice salad that was made for said reunion. I was so wowed by it that I vowed to make my own version. That was 6 months ago. At least. Now, I’ve decided to finally bust out my own recipe for it to take part in this week’s RootSource Challenge, over at CookThink, where there secret ingredient is orzo. Having made it this many months later, I still love the idea of it and it is delicious. As I’ve said, you can really make this anyway you’d like. It’s versatile and can be dressed with any sort of dressing, as well. I can totally see this being made a month or so from now using feta, fresh basil, and coming-into-season tomatoes. I think the wild rice is important for textural reasons. For my version, I used dried currants for some texture and tang, yellow and orange peppers for color and sweetness, and toasted pine nuts for a warm, nutty element. – Cook wild rice and orzo – separately – per instructions on packaging. Drain each well and allow to cool. – When ingredients are cool, combine all ingredients except for the pine nuts in a mixing bowl and blend well. – Directly before serving, add additional salt and pepper to taste and stir in toasted pine nuts. Add fresh parsley or other herbs you have on hand, if desired. Oh, I love both orzo and wild rice. I’ve mixed orzo and regular rice for pilafs, but this sounds like a terrific, tasty mix of two textures. Thanks for the recipe! Always on the lookout for recipes with wild rice. Perfect blend of flavours! The wild rice adds so much, I’ll have to try! I make mine with just orzo, and add feta cheese, olives, scallions, red onion…with the peppers, it’s a great dish. This picture looks delicious. I love impromptu recipes.